The following 9 Montana tokens are available as a group for 39.50. 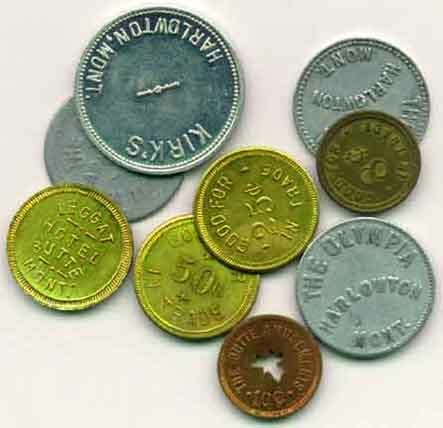 All Montana tokens are scarce and these represent an excellent value in as much as the group includes the 8 Cent piece from Butte. These are available while supplies last. 1) The Olympia from Harlowton, MT, good for 25 cents. Struck in Aluminum. 2) Another as above but struck from different dies. 3) Yet another variety as above but struck from different dies. 4) Kirk’s from Harlowton, MT, good for $1.00 in trade. Struck in Aluminum. 5) The Butte Amusment, Butte, MT, good for 10 cents. Struck in bronze with a star punched out of the center. 6) Crystal Creamery, Butte, MT, Good for 8 cents. This is an extremely unusual denomination and worth a premium as such. Struck in Bronze. 7) Leggat Hotel, Butte, MT, Struck in yellow bronze. Good for 12 1/2 cents. 8) As above good for 25 cents. 9) As above good for 50 cents.